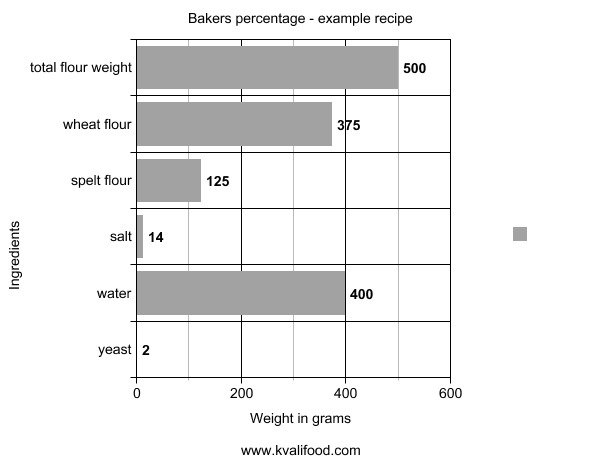 Baker's percentage formula can be a somewhat confusing because you do not end up at 100% when you add all the percentages together. You also have to use a bit of math to figure out how to mix your own breads. But it has some major advantages. It's easier to remember recipes as a percentage formula since they are the same regardless of the amount of bread and the size of the loaf. You'll get easier overview of "patterns" in your recipes so you understand bread better. You will get an instinctive feel for any bread recipe. You can easily change a small part of the recipe in an educated manner and see what effect it has. In the examples below I use the metric system. If you find that confusing then just think of gram (g) as ounce (oz). The important thing is that you just use one unit. So no mixing of oz and lbs for example. Then the calculations will be all the same. 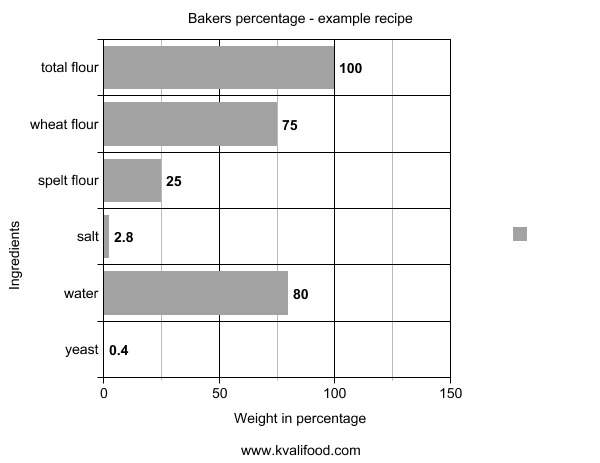 You calculate any ingredients "percentage" relative to the total amount of flour in the recipe. This includes whole flour, flour kernels, whole wheat, rye flour, etc etc. 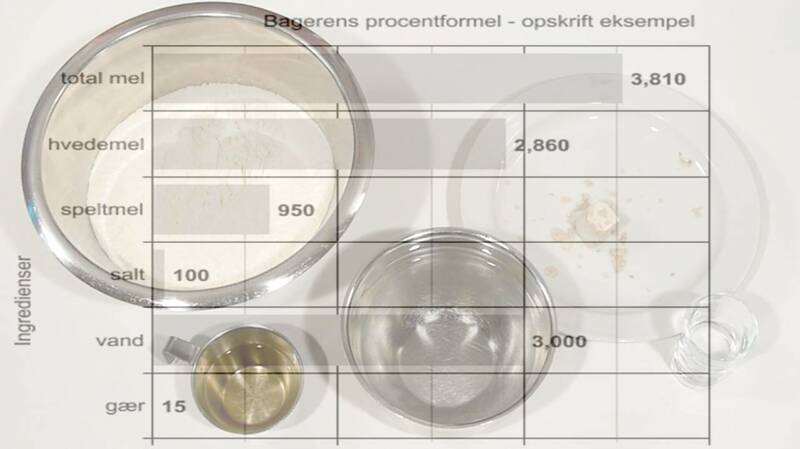 Any flour whatsoever and you add them together and find the total weight. This weight is defined as "100%". The rest of the ingredients of the recipe are then calculated in relation to that total weight. The above recipe use a mix of weight and volume: gram, dl (100 ml), tsp, pea. This is perfectly normal, and is often used to make the measurements faster in a home kitchen. But it is unusable for calculating the bakers percentage. At this stage we can compare the amounts directly. We can even put them in a graph. You don't usually do this, but it might visualise the principle better. So here goes. Now that we got comparable weights we can use those to calculate the percentages. total flour %: 100% - per definition. This is the part that makes the lest sense in bakers percentage. That the total percentage is not 100% as one would assume when adding all ingredients in a recipe. But this way of doing it has the advantage that it is easier to compare recipes. tw = (tp * tfw) / 100 = (500 * 183.2) / 100 = 916 g or approx. 1 kg. (2 lbs) which is a very normal weight for a large loaf of bread. 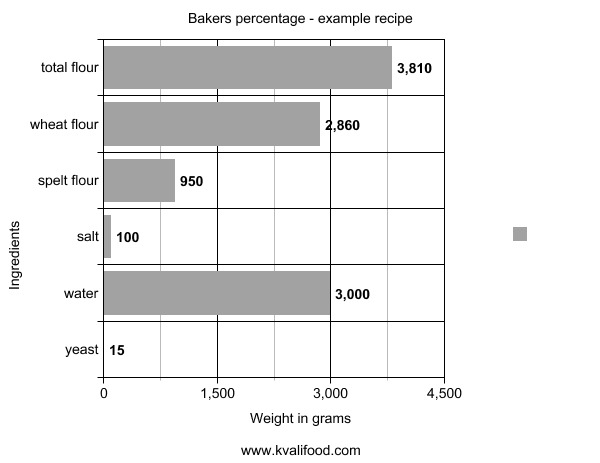 An advantage of the bakers percentage is that it is easy to calculate new weights for other amounts of bread. We just need to find out how much weight each percentage point each corresponds to, and then multiply with that. 7000 g / 183.2% = 38.2 g/%. What this number says it that each percentage point in the recipe corresponds to 38.2 g.
246 oz / 183.2% = 1.34 oz/% each percentage point in the recipe corresponds to 1.34 oz. These numbers has a precision that is not needed and looks confusing. So the recipe is hard to read, and it is implied that it is important that you use 2,865 g flour and not 2,866 g. Which makes absolutely no difference in practice. To get a nicer recipe we round them up. Which is the final recipe. And as you can see in the graph below, the relative values are exactly the same in the final recipe as in the first one. Only there is more of each thing. Which is as it should be. A starter is a small amount of dough or batter (like a sourdough) that you make in advance and then use instead of yeast. This complicates matters a bit, as a starter also contains flour and liquid. Should they be counted as part of the %'es? It is valid to see the starter as a separate ingredient. So you just calculate that as a percentage too. This is the way I usually do it. pro: easy to use for pre ferments that you can just make any amount of in any hydration you prefer. con: Does not represent the true value of flour and liquid in the bread. pro: gives the correct values for all the ingredients. con: you must make a starter with a precise hydration and in a precise weight. Or take the ingredients of the starter from the recipes ingredients. Hi. I have started a sourdough starter so if I take the ingredients of the starter away from the recipes ingredients, what do I do about the yeast? Just omit? Thank you. I am not completely sure I understand your question. Do you want to make a known yeast recipe, but with sourdough instead of yeast?